Connected AWS accounts must be in one group. To change the group, you must be either an account admin, or an admin of both the old and new group. 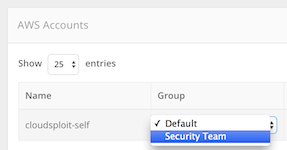 On the "AWS Accounts" page, change the drop-down next to the connected account and select a new group. If you do not see additional groups, you do not have the required permissions to make a change.